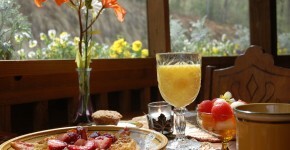 The Main Lodge is our B&B and you will remember your breakfasts. 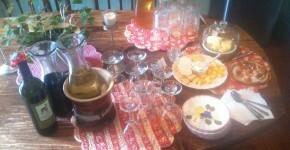 Dianne has published three cookbooks and is a former restaurant & bakery owner and chef. Pictured is her signature "Lighter Than Air" yeast raised waffles! We serve appetizers and beverages each afternoon from 4:30 till 6:00 PM. 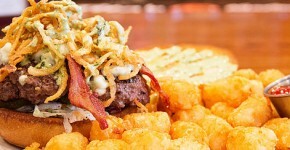 And, Dahlonega offers numerous owner-run, unique restaurants. Seafood, Cajun, Steaks, Italian, Mexican and more are all in walking distance from the Dahlonga Square. From pub food to fine dining, you can find just want you want. And, all are casual. 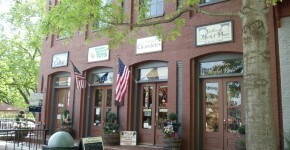 As with restaurants, Dahlonega has unique shopping for guests to enjoy. Art, antiques, gifts, pottery, jewelry and more in a historic downtown. We have looked far and wide for the items that will make your breakfasts a great experience. 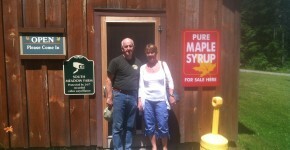 We use only real maple syrup from South Meadow Farms near Lake Placid, NY. Our coffee and specialty loose leaf teas come from our friends at Texas Coffee Traders in Austin, TX. Dahlonega Walking Tours offer a culinary & cultural stroll around the town square with quite a sampling of our independent restaurant & food shop goodies.